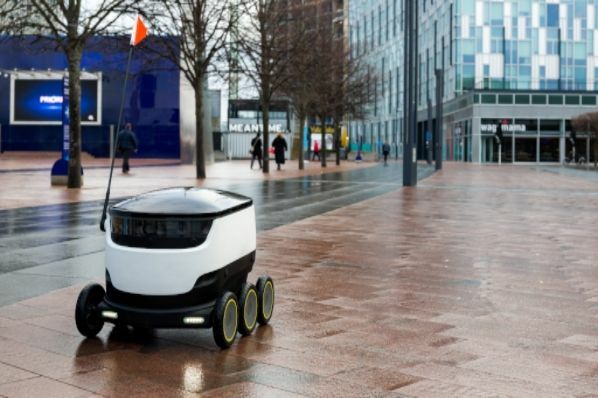 Two states, Virginia and Idaho, have now passed laws that allow robots to deliver packages, which means they can move along sidewalks and crosswalks --and in Idaho do so without a person controlling them. However, new questions are emerging about whether the laws could lock out competition. As we reported recently, the Estonia-based Starship Technologies worked with lawmakers to develop some regulations that would get the technology on the road. It’s working with other states as well. Overseas, Starship’s delivery robots are out and about delivering pizzas in Germany and the Netherlands and Hermes luxury goods in London. Some are questioning whether the legislation permitting delivery robots favors Starship over its competitors. The Virginia law only permits delivery robots that are under 50 pounds to operate legally and Idaho caps the weight limit at 80 pounds. In Wisconsin, a bill about legal operation of autonomous ground-delivery robots is now in committee discussions, and currently proposes an 80-pound weight limit. Starship’s rover weighs 40 pounds. For Starship’s competitors such as San Francisco-based Marble, which has a rover that weighs more than 80 pounds, and Vespa’s Gita rover, which weighs 70 pounds, the limits seem arbitrary and unfair. “The 50-pound limit came about in discussion about what would be the most approachable and safest route that a pedestrian would feel safe with this robot traveling next to them,” said Rep. Ron Villanueva from Virginia, one of the lawmakers who championed the state’s new robot policy. “Marble’s robots are built around the form factor of modern-day electric mobility scooters,” CEO Matt Delaney said in a statement to Recode. Delaney said he doesn’t think the weight limits that are being written into the new statewide robot laws are reasonable. Marble is currently in talks with the San Francisco City Council around future robot-delivery regulations in the city, according to a company spokesperson. Wisconsin is another state with a bill moving through the legislature. One spokesperson said they just doubled the weight of Starship’s robot to arrive at their limit. What’s promising for competitors is that these laws have provisions that allow municipalities to change the law to meet their needs such as restricting operation to certain times of the day or increasing the weight limits. The question is whether the laws favor Starship’s operation over its competitors. By working with one company to develop their laws, the unintended consequence is that this company gets the benefit of compliance in ways that its competitors didn’t. We often see established companies and industries lobbying lawmakers to pass regulations or laws that keep out new, market-driven competition. The sharing economy is a good example of that. In addition, the challenge of creating new regulations around technology is how quickly they can become outdated as technology develops in new ways. We’ll keep watching to see how states and municipalities adjust to the changing technology while considering the needs and considerations of communities. It worthwhile to ask though when trying to ensure innovation can flourish what is the right role for government and how do you ensure that laws don’t choose winners and losers.